John Lee Cronin (left) and his father Mark Cronin share the inspirational story of John’s Crazy Socks to entrepreneurship students at Carleton University. 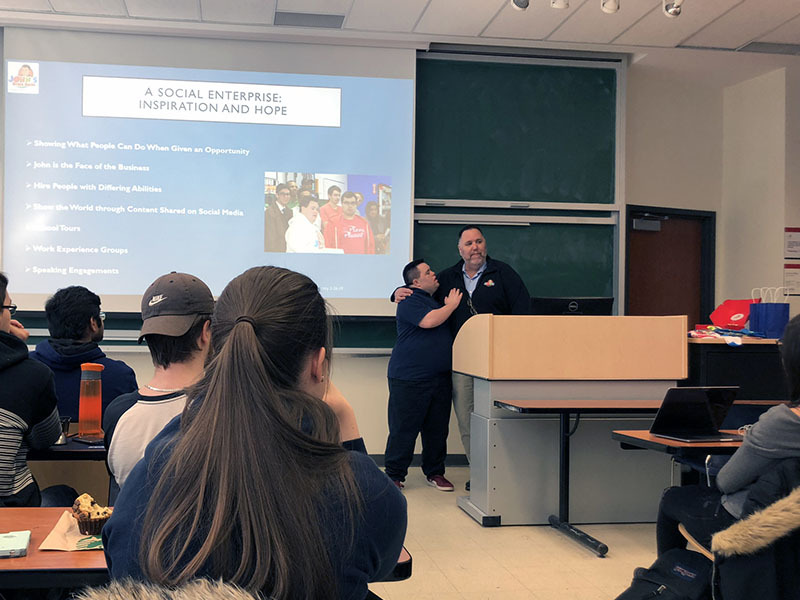 On March 26, 2019, founders John and Mark Cronin of John’s Crazy Socks paid a visit to an introductory entrepreneurship course at Carleton University, and shared their story of how they turned a passion for socks into a social enterprise. 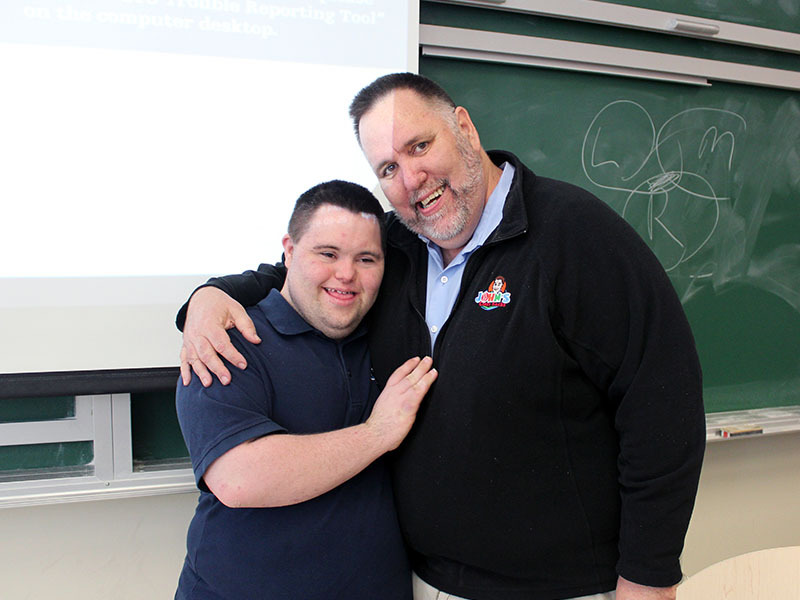 In the fall of 2016, John, who has Down syndrome, was entering his last year of high school and approached his father with the idea of going into business together. As “two knuckleheads from the suburbs of New York City”, as Mark says, they had no background in retail or starting a business. They started to brainstorm and went through many possible ideas before landing on crazy socks. John’s Crazy Socks is now a multi-million-dollar e-commerce company with the mission to “Spread Happiness”, inspiring people from all over the world. The customer’s happiness is very important to John and Mark, and John introduced the idea of including candy and a handwritten thank you note in each box of socks to make the transaction more personal. For the entrepreneur duo, it wasn’t enough to just sell socks. They wanted to show the world that people with differing abilities are capable of amazing things once given the chance. “John is the face of the business, also known as the Chief Happiness Officer, and is fully involved with day-to-day tasks,” said Mark. “Out of the 39 jobs we have created, 23 are held by people with differing abilities. The unemployment rate amongst the disabled is 70%, and that is an untapped world of labour filled with people are willing, ready, and able to work. In addition to being an inclusive employer, John and Mark believe in giving back. The company sells a line of awareness socks to celebrate people with special conditions, donating a portion of each sale to their charity partners. Five per cent of each order placed online is also donated to the Special Olympics, an organization that is special to John as a Special Olympics athlete. John and Mark Cronin shared how John’s Crazy Socks is achieving their mission of spreading happiness and the impacts they are making through the social enterprise. The road to success for John and Mark was not without twists and turns. With no previous experience in running a business, many mistakes were made at the start of their journey. Their online store opened on December 9, 2016, and just a few days later, they were running out of inventory. Mark rushed out to buy as many socks as he could to stock up their store. They made over 450 sales in that first month, but after the holiday rush died down, they quickly saw their sales plummet. Adapting to the seasonal retail cycle was a learning curve for John and Mark. With limited funds in the beginning, John made his own marketing videos on YouTube and Facebook, and made thank you videos as a way to reach out to his valued customers. This is something that they still do today to engage with their customers, to showcase their diverse employees and to test new products and sock designs. The company’s videos have been viewed over 4 million times, and media videos about them have been viewed over 70 million times. The opportunity for John and Mark to speak at Carleton was possible thanks to the Embassy of the United States who reached out to Francois Brouard, Director of the Sprott Centre for Social Enterprise.